Born in Neunkirchen, Westphalia, Prussia, December 12, 1806, Isaac Leeser was orphaned at an early age. He received his secular education at a gymnasium in Munster, and his religious tutelage from Rabbis Benjamin Cohen and Abraham Sutro. At age eighteen, Leeser joined his uncle Zalman Rehine in Richmond, Virginia, where he began to prepare for a business career while simultaneously assisting the local religious functionary, the Reverend Isaac B. Seixas. An article Leeser published in defense of Judaism brought him to public attention and also brought in 1829 an invitation to occupy the pulpit of Philadelphia's congregation Mikveh Israel. During the next forty years Isaac Leeser was the most prolific American Jewish writer and the most creative Jewish communal architect. Instruction in the Mosaic Religion, Philadelphia, 1830. General Collection. Leeser brought with him to Philadelphia his translation of J. Johlson's Instruction in the Mosaic Religion. He had it published there in 1830, appropriately dedicated to his uncle Zalman Rehine. The book is a catechism published in Germany and translated and adapted by Leeser for "the instruction of the younger ... of Israelites of both sexes, who have previously acquired some knowledge of the fundamental part ... of their religion." Leeser undertook its publication because there was a great scarcity of elementary textbooks for Jewish children. 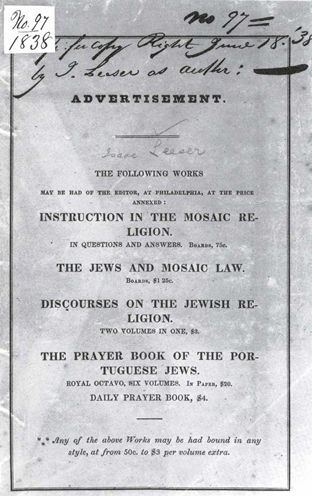 It is significant that this Instruction in the Mosaic Religion, Leeser's first issued work, is a textbook of religious instruction for the young, for though Leeser attained distinction as an author, translator, editor, and a national leader of the American Jewish community, he considered himself, first and foremost, an educator. In 1838 he issued The Hebrew Reader and a year later, Catechism for Younger Children. The Reader, initially prepared for a newly established Sunday School in Philadelphia, was, in the words of Leeser, "used over a large surface as a first book of instruction in Hebrew," attaining a seventh edition in 1873. If any event in my life can afford me some degree of satisfaction, it is the consciousness of having added one contribution ... to satisfy the demand for information in the ways of the law of God. And it will be to me a far greater gratification than any public applause, could I be convinced that the thoughts offered in this guide to the young Israelites has led a few as sincere worshippers to the house of our God. The Library has copies of both the Reader and the Catechism which Leeser himself had sent at the time of publication to establish his copyright. The Catechism is dedicated to "Miss Rebecca Gratz, Superintendent of the Sunday-School for Religious Instruction of Israelites in Philadelphia," whom Leeser credits with the founding of the school. But it was he himself who was the instigator of the school, for while still in Richmond he had, together with the Reverend Isaac B. Seixas, founded such a school, which met "with but partial success." As early as 1835, Leeser urged the establishment of a Jewish all-day school; and, in 1846, the Hebrew Education Society of Philadelphia was founded, chartered for "the establishment of a school or schools within ... Philadelphia, in which are to be taught the elementary branches of education, together with the sciences, and modern and ancient languages, always in combination with instruction in Hebrew language, literature and religion." The Hebrew Reader, No. 1. The Spelling Book, Philadelphia, 1838. General Collection. Its charter also granted the right "to establish ... a superior seminary of learning ... the faculty of which ... shall have power to furnish to graduates and others the usual degrees of Bachelor of Arts, Master of Arts and Doctor of Law and Divinity." In 1867, Leeser was instrumental in establishing the first rabbinical seminary in America, Maimonides College, which survived its founder by only four years, having to close its doors in 1873. While still in Richmond, Leeser began his literary career with a defense of the Jews against an attack which first appeared in the London Quarterly Review and was reprinted in a New York newspaper. His works continued to involve him in polemics. In 1834, he published The Jews and Mosaic Law, a defense of the Revelation of the Pentateuch and of the Jews "for their adherence to same." The book's twenty-six chapters show wide reading in the contemporary religious literature. Leeser was aware that just as he was reading works on religion written by Christians, so too were many other young Jews. What was needed was a polemic arguing for loyalty to the ancestral faith and adherence to its ways. 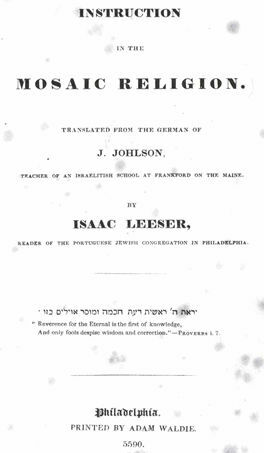 Leeser's Discourses, Argumentative and Devotional on the Subject of the Jewish Religion (1837) were, as the title page reports, "delivered at the Synagogue Mikveh Israel, in Philadelphia, in the years 5590-5597 (1830-37). Its 590 pages are filled not only with sermons in the usual sense, but also with scholarly essays on such themes as God, the Holidays, and "The Messiah." An address on behalf of "The Female Hebrew Benevolent Society" of Philadelphia emphasizes his espousal of women's participation in Jewish communal enterprises. The copyright copies of both books may be consulted in the Library, as well as his liturgical and biblical publications. In 1845, he issued an edition of the Pentateuch in five volumes, entitled The Law of God, with Hebrew text, "edited and with former translations diligently compared and revised by Isaac Leeser." Eight years later, Leeser published a translation of the entire Bible, the first translation of the entire Bible into English by a Jew. His translation of the Sefardi prayer book into English was published in six volumes in 1837-38, and a decade later, in 1848, appeared The Book of Daily Prayers for Every Day in the Year According to the Custom of the German and Polish Jews, which he edited and translated. Commemoration of the Life and Death of William Henry Harrison, Philadelphia, 1841. General Collection. Leeser founded and, for a quarter of a century from 1843-68, edited the first Jewish periodical, The Occident. (The Jew, which appeared in 1823-25, was merely a polemical response to a missionary publication.) He organized the first Jewish publication society and edited its publications. He inspired and helped to found a foster home for Jewish children, a Jewish hospital, and a union of charities. Nor can we ignore his contributions as an American clergyman, which may be glimpsed from two items in the Library's collection: a pamphlet, Commemoration of the Life and Death of William Henry Harrison, by Isaac Leeser, Philadelphia, 5601 (1841); and a letter from Leeser to President Lincoln, of August 21, 1862. Leeser's funeral address is the first published eulogy for a president by a Jewish cleric. One brief section gives an idea of Leeser's democratic sentiments. In the brief sketch we have just furnished of the life and services of General Harrison, it will be perceived that he passed through every stage of promotion, and that he rose from a humble standard-bearer to the chief command of the army and navy, and the presidency of the councils of his native land; and he thus reached a station as high as human ambition can look for; because the voluntary suffrage of a free people raising one of their own fellow-citizens to the highest honour within their gift, is a far more enviable distinction than a throne inherited by a stripling from a royal ancestry, or acquired through violence by an adventurous military chieftain. it is to be expected that not a few persons of our persuasion will be brought hither in a condition to require spiritual no less than bodily care. in fact two at least of our persuasion have already died in the hospitals ... it has at our last meeting been deemed highly expedient to have a Jewish chaplain appointed by the President of the United States. 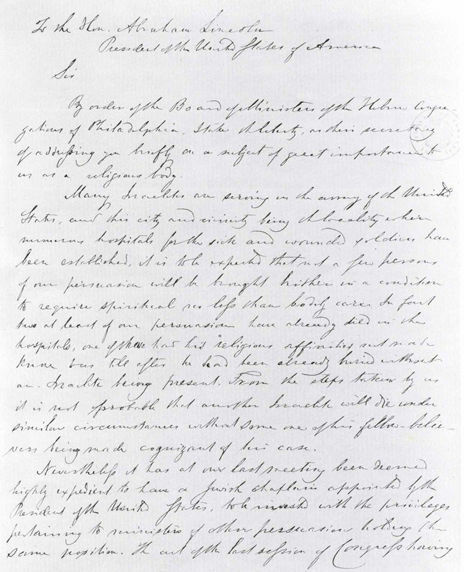 In his capacity as Secretary of the Board of Ministers of the Hebrew Congregations of Philadelphia, Isaac Leeser wrote to President Lincoln on August 21, 1862 asking that a Jewish chaplain be appointed to minister to the spiritual needs of sick or wounded Jewish soldiers in military hospitals in Philadelphia and its vicinity. The President directs me to refer the enclosed communication to you with the request that you will favor him with your opinion in regard to the legality and propriety of granting the request of the Board of Hebrew Ministers. If possible the President would like this to be done. Respectfully returned to the President of the United States. The Surgeon General considers it both legal and proper, that Chaplains of the Hebrew faith should be appointed in the Army. 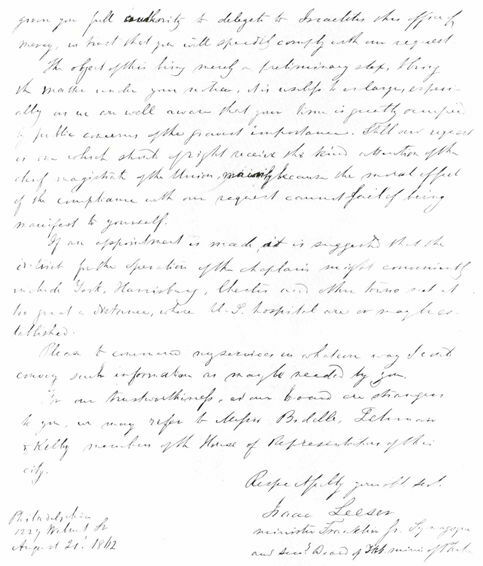 The following day John Hay sent Leeser the good news, and on the president's behalf asked for the Board to "designate the proper person for the purpose." The Board chose the Reverend Jacob Frankel of Congregation Rodeph Sholom, who was commissioned on September 12, the first rabbi to serve as a military chaplain in the United States. Sources:Abraham J. Karp, From the Ends of the Earth: Judaic Treasures of the Library of Congress, (DC: Library of Congress, 1991). Portrait of Isaac Leeser, published by I. Goldman in 1868, the year of Leeser's death. Prints and Photographs Division.